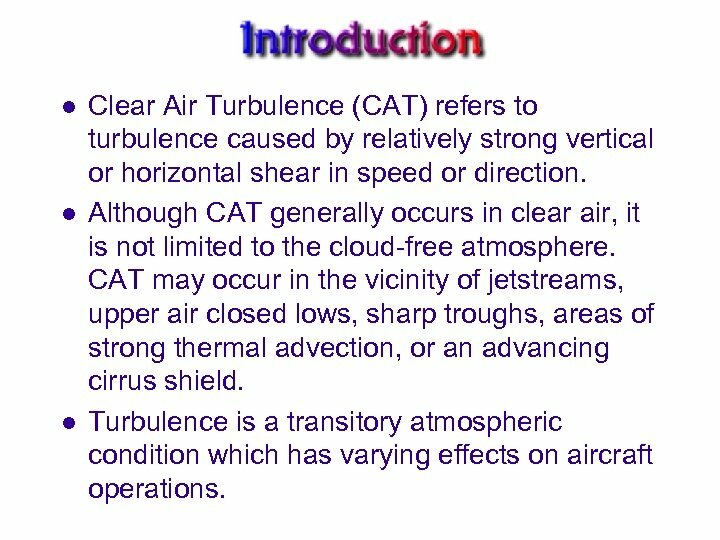 l l l Clear Air Turbulence (CAT) refers to turbulence caused by relatively strong vertical or horizontal shear in speed or direction. Although CAT generally occurs in clear air, it is not limited to the cloud-free atmosphere. 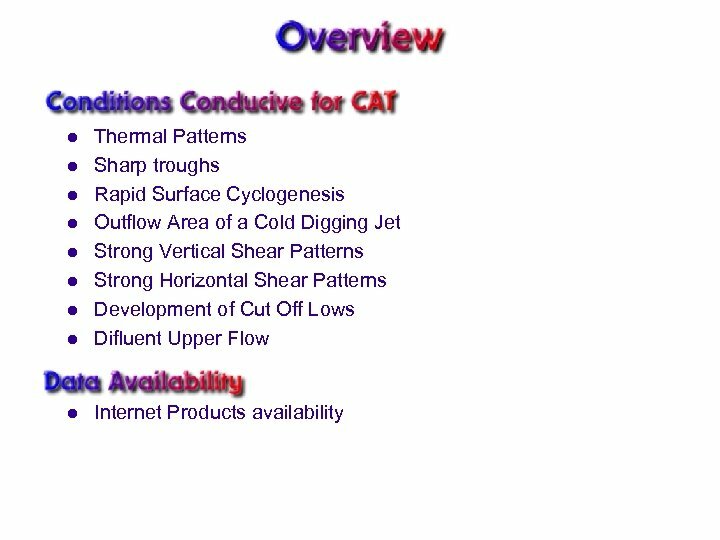 CAT may occur in the vicinity of jetstreams, upper air closed lows, sharp troughs, areas of strong thermal advection, or an advancing cirrus shield. Turbulence is a transitory atmospheric condition which has varying effects on aircraft operations. l l l Turbulence can rip an aircraft apart in flight, damage the air frame, and cause injury or death. 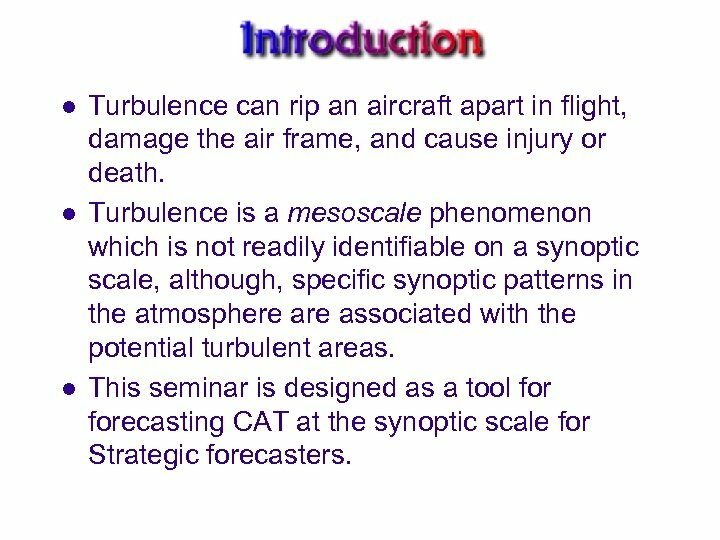 Turbulence is a mesoscale phenomenon which is not readily identifiable on a synoptic scale, although, specific synoptic patterns in the atmosphere associated with the potential turbulent areas. This seminar is designed as a tool forecasting CAT at the synoptic scale for Strategic forecasters. l l Cold Air Advection. 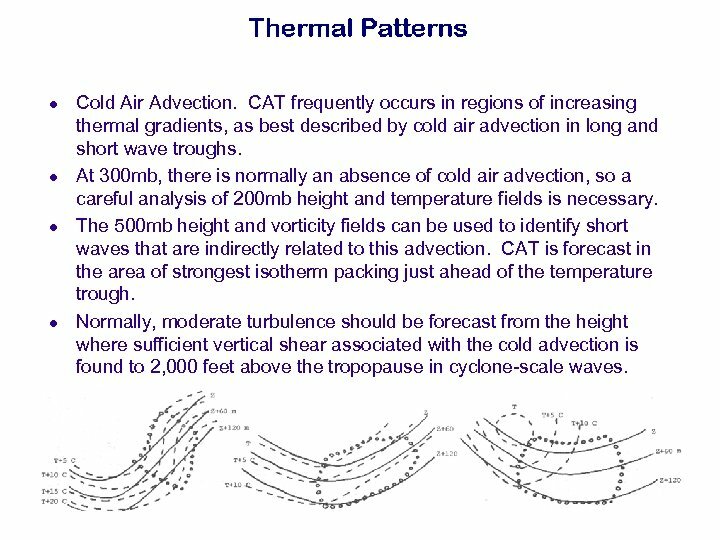 CAT frequently occurs in regions of increasing thermal gradients, as best described by cold air advection in long and short wave troughs. At 300 mb, there is normally an absence of cold air advection, so a careful analysis of 200 mb height and temperature fields is necessary. The 500 mb height and vorticity fields can be used to identify short waves that are indirectly related to this advection. CAT is forecast in the area of strongest isotherm packing just ahead of the temperature trough. Normally, moderate turbulence should be forecast from the height where sufficient vertical shear associated with the cold advection is found to 2, 000 feet above the tropopause in cyclone-scale waves. l l Warm Air Advection. Warm air advection can also increase horizontal temperature gradients, though this mechanism is weaker in short waves and may be overlooked when cold air advection is nearby. Adjacent to the tropopause, however, the association of warm air advection with anticyclonic accelerations and the resulting horizontal speed sheer make an effective combination. 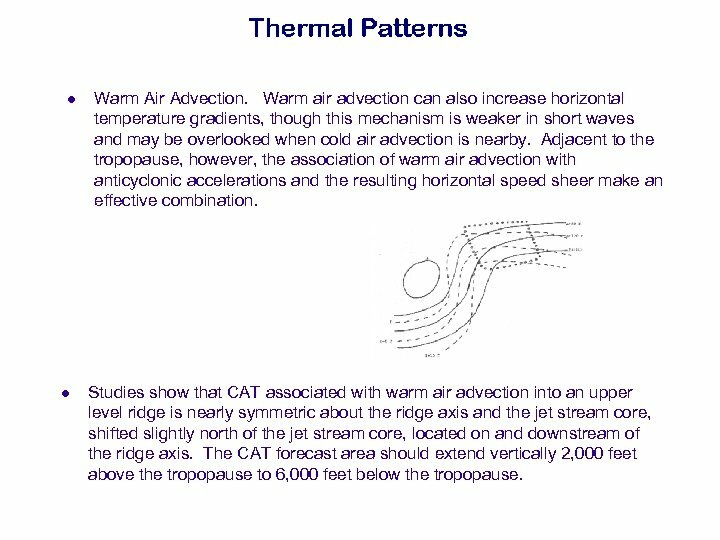 Studies show that CAT associated with warm air advection into an upper level ridge is nearly symmetric about the ridge axis and the jet stream core, shifted slightly north of the jet stream core, located on and downstream of the ridge axis. The CAT forecast area should extend vertically 2, 000 feet above the tropopause to 6, 000 feet below the tropopause. l l Large horizontal wind shears found near the base of sharp, rapidly moving troughs, where the direction of flow changes most rapidly, are indicative of large gradients of vertical motion. Tightly packed isotherms are frequently found in these areas. 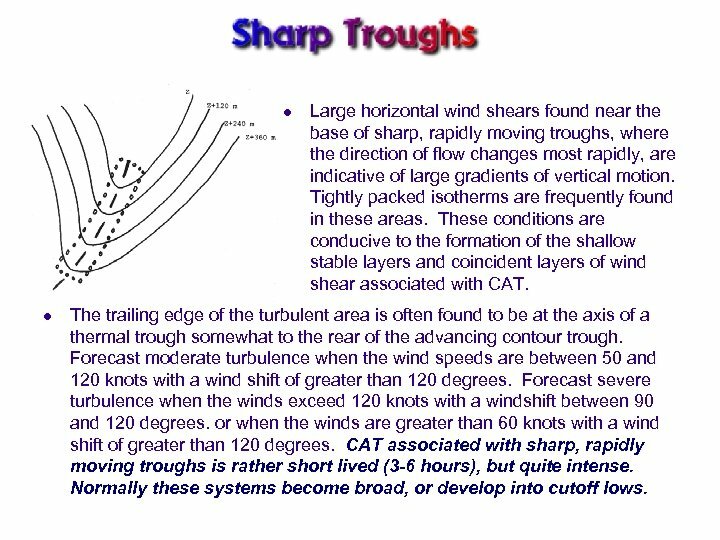 These conditions are conducive to the formation of the shallow stable layers and coincident layers of wind shear associated with CAT. The trailing edge of the turbulent area is often found to be at the axis of a thermal trough somewhat to the rear of the advancing contour trough. Forecast moderate turbulence when the wind speeds are between 50 and 120 knots with a wind shift of greater than 120 degrees. Forecast severe turbulence when the winds exceed 120 knots with a windshift between 90 and 120 degrees. or when the winds are greater than 60 knots with a wind shift of greater than 120 degrees. CAT associated with sharp, rapidly moving troughs is rather short lived (3 -6 hours), but quite intense. Normally these systems become broad, or develop into cutoff lows. l l During the early stages of surface cyclogenesis, the main jet core is usually 5 to 10 degrees latitude north of the surface low. However, some low centers move or redevelop north of the main jet core while still in the early stages of cyclogenesis. This results in a second jet core forming 5 to 10 degrees latitude to the left of , and parallel to, the main jet stream core. 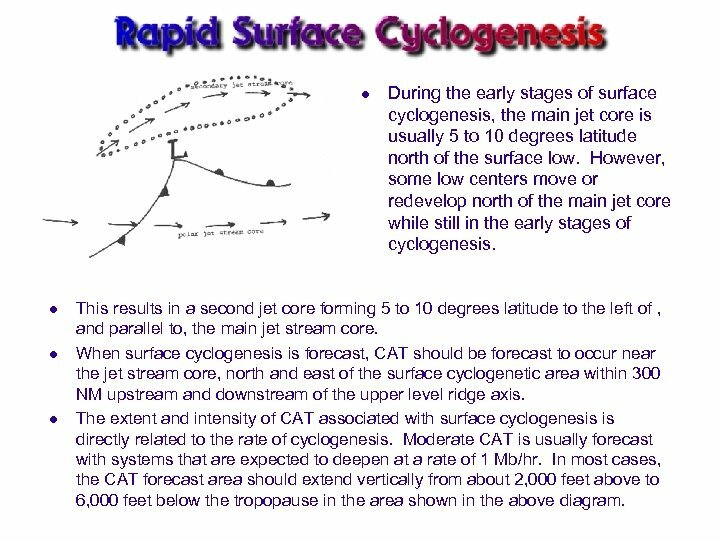 When surface cyclogenesis is forecast, CAT should be forecast to occur near the jet stream core, north and east of the surface cyclogenetic area within 300 NM upstream and downstream of the upper level ridge axis. The extent and intensity of CAT associated with surface cyclogenesis is directly related to the rate of cyclogenesis. Moderate CAT is usually forecast with systems that are expected to deepen at a rate of 1 Mb/hr. In most cases, the CAT forecast area should extend vertically from about 2, 000 feet above to 6, 000 feet below the tropopause in the area shown in the above diagram. 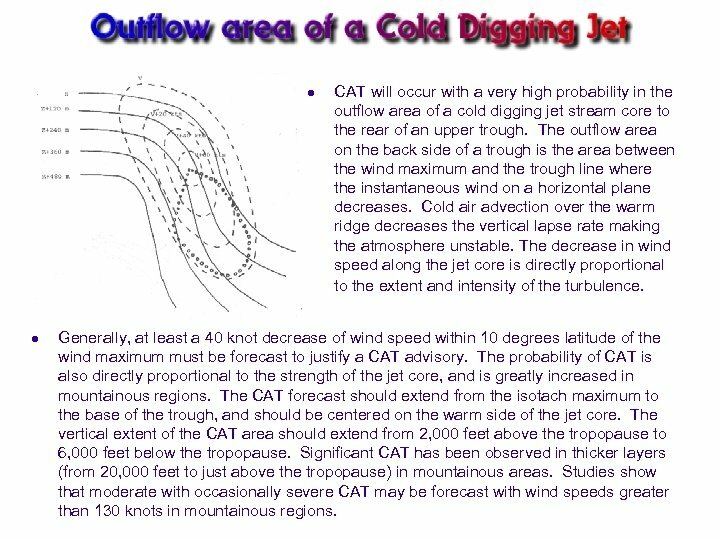 l l CAT will occur with a very high probability in the outflow area of a cold digging jet stream core to the rear of an upper trough. The outflow area on the back side of a trough is the area between the wind maximum and the trough line where the instantaneous wind on a horizontal plane decreases. Cold air advection over the warm ridge decreases the vertical lapse rate making the atmosphere unstable. The decrease in wind speed along the jet core is directly proportional to the extent and intensity of the turbulence. Generally, at least a 40 knot decrease of wind speed within 10 degrees latitude of the wind maximum must be forecast to justify a CAT advisory. The probability of CAT is also directly proportional to the strength of the jet core, and is greatly increased in mountainous regions. The CAT forecast should extend from the isotach maximum to the base of the trough, and should be centered on the warm side of the jet core. The vertical extent of the CAT area should extend from 2, 000 feet above the tropopause to 6, 000 feet below the tropopause. Significant CAT has been observed in thicker layers (from 20, 000 feet to just above the tropopause) in mountainous areas. Studies show that moderate with occasionally severe CAT may be forecast with wind speeds greater than 130 knots in mountainous regions. l Tilted ridges and troughs move faster in certain levels than in others so that a station could lie underneath an upper air ridge or trough line and report winds from different directions at different levels. l Tilted troughs usually occur when the cut-off low is pulling out, moving northeastward. Often the trough moves out fast at the lower levels causing the tilt. This feature often occurs with warm air advection in the ridge near the southern jet branch. Turbulence occurs near the southern jet branch in both cases so the predominant cause may be hard to pinpoint. If turbulence is at the mid or high levels in the southerly jet stream, warm air advection is likely the cause. Tilted trough turbulence usually occurs at the mid levels in the nearby col area. l Dynamic folding ridges lag at higher levels, so that the low-level flow lies under the trough line. The highest potential for turbulence is north of the trough from 27, 000 to 40, 000 feet. Moderate CAT is normally forecast for this area, which occurs rarely. l l Studies show that CAT is likely to occur to the north of the jet stream core in the region of strong antycyclonic horizontal shear. 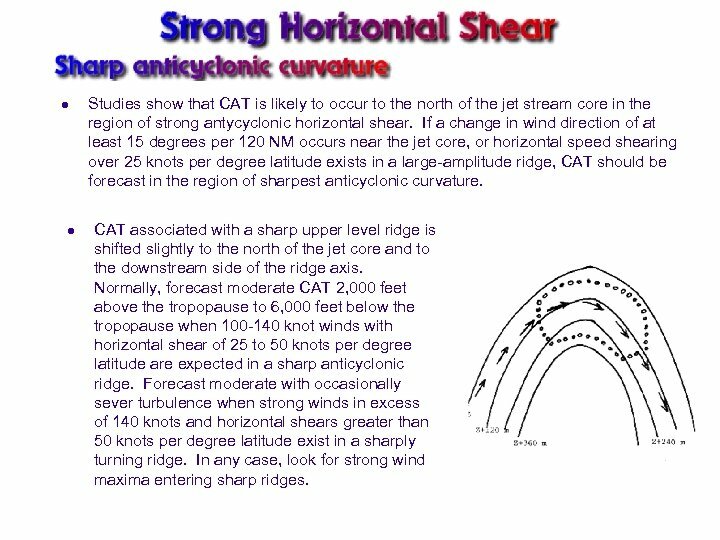 If a change in wind direction of at least 15 degrees per 120 NM occurs near the jet core, or horizontal speed shearing over 25 knots per degree latitude exists in a large-amplitude ridge, CAT should be forecast in the region of sharpest anticyclonic curvature. CAT associated with a sharp upper level ridge is shifted slightly to the north of the jet core and to the downstream side of the ridge axis. Normally, forecast moderate CAT 2, 000 feet above the tropopause to 6, 000 feet below the tropopause when 100 -140 knot winds with horizontal shear of 25 to 50 knots per degree latitude are expected in a sharp anticyclonic ridge. Forecast moderate with occasionally sever turbulence when strong winds in excess of 140 knots and horizontal shears greater than 50 knots per degree latitude exist in a sharply turning ridge. In any case, look for strong wind maxima entering sharp ridges. l Areas of strong horizontal shear can be easily detected using satellite imagery and upper level isotach analyses and forecasts. Horizontal wind shear greater than 25 knots per degree of latitude is sufficient to generate large transverse waves that are best observed when transverse banding (herringbone cloud pattern) is noted on satellite imagery. 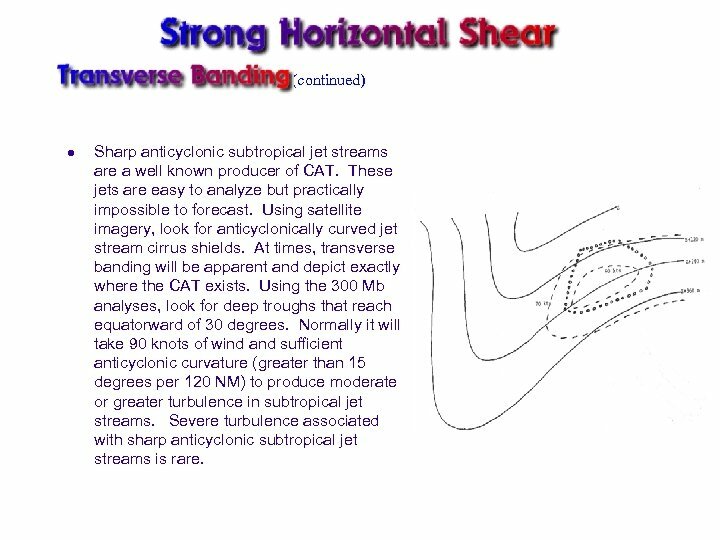 This concept applied south of the jet axis where strong anticyclonic shear exists and slightly north of the jet core where strong cyclonic shear exists. These large waves alternately expand compress the shear zone at the tropopause, and amplify existing turbulence. 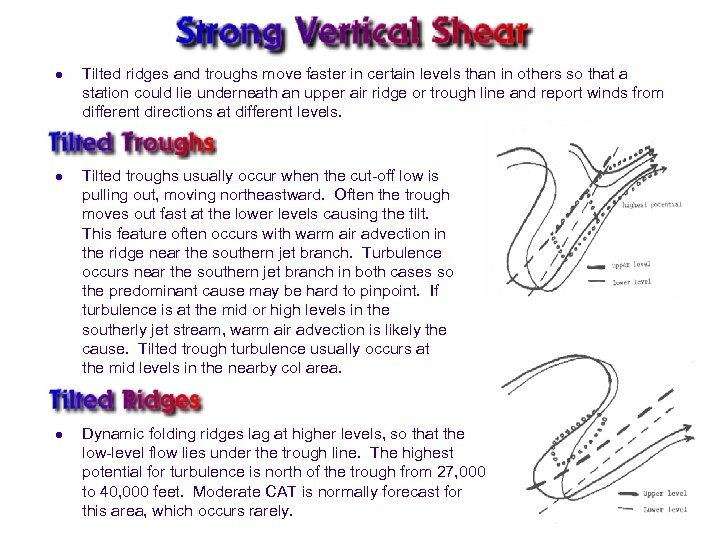 l CAT can also occur in strong troughs where there is considerable anticyclonic horizontal shear. CAT can be rather intense, but is fairly short lived (around six hours duration) and uncommon. Look for jet maxima climbing into a strong ridge pattern and the resulting strong anticyclonic turning and transverse banding. (continued) l Sharp anticyclonic subtropical jet streams are a well known producer of CAT. These jets are easy to analyze but practically impossible to forecast. Using satellite imagery, look for anticyclonically curved jet stream cirrus shields. At times, transverse banding will be apparent and depict exactly where the CAT exists. Using the 300 Mb analyses, look for deep troughs that reach equatorward of 30 degrees. Normally it will take 90 knots of wind and sufficient anticyclonic curvature (greater than 15 degrees per 120 NM) to produce moderate or greater turbulence in subtropical jet streams. Severe turbulence associated with sharp anticyclonic subtropical jet streams is rare. l With the development of an upper level cutoff low, CAT often occurs in the zones of confluent and difluent flow with converging axes of maximum wind and large wind shear. The flow is subjected to rapid deceleration in the difluent flow and rapid acceleration in the confluent flow. Studies show that after the cut of low forms, only light CAT can be expected in the region just north of the low center. 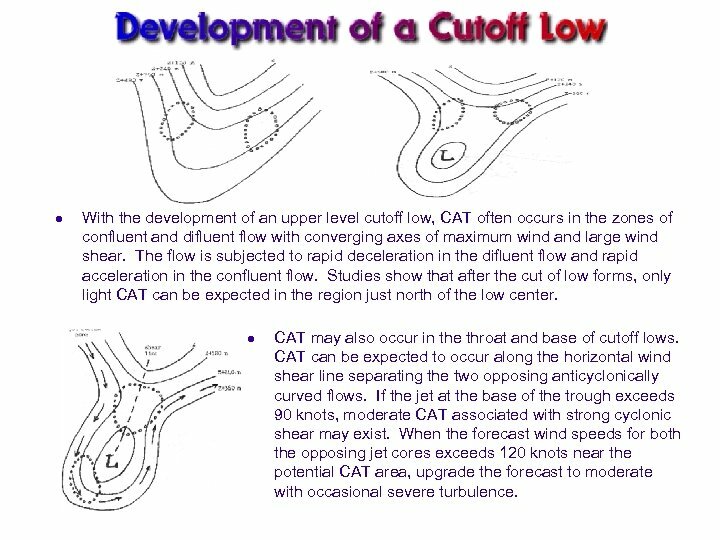 l CAT may also occur in the throat and base of cutoff lows. 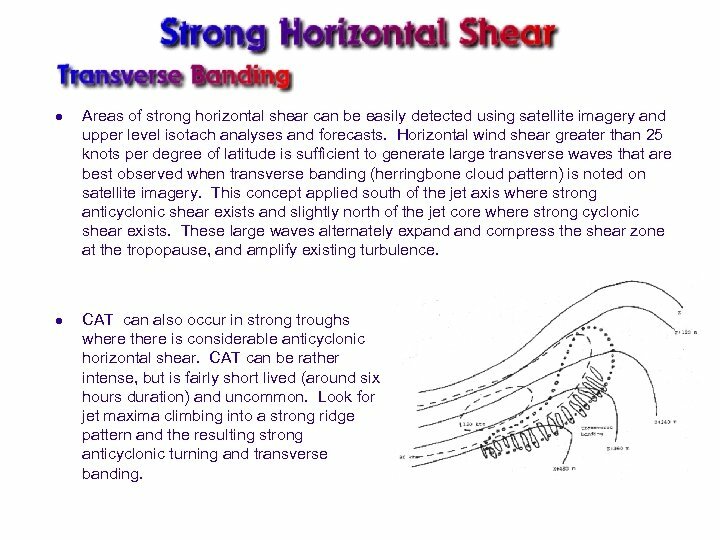 CAT can be expected to occur along the horizontal wind shear line separating the two opposing anticyclonically curved flows. 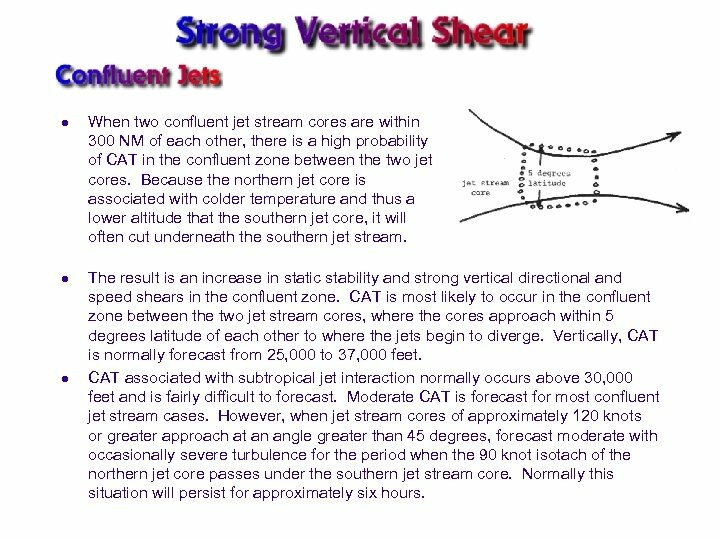 If the jet at the base of the trough exceeds 90 knots, moderate CAT associated with strong cyclonic shear may exist. When the forecast wind speeds for both the opposing jet cores exceeds 120 knots near the potential CAT area, upgrade the forecast to moderate with occasional severe turbulence. 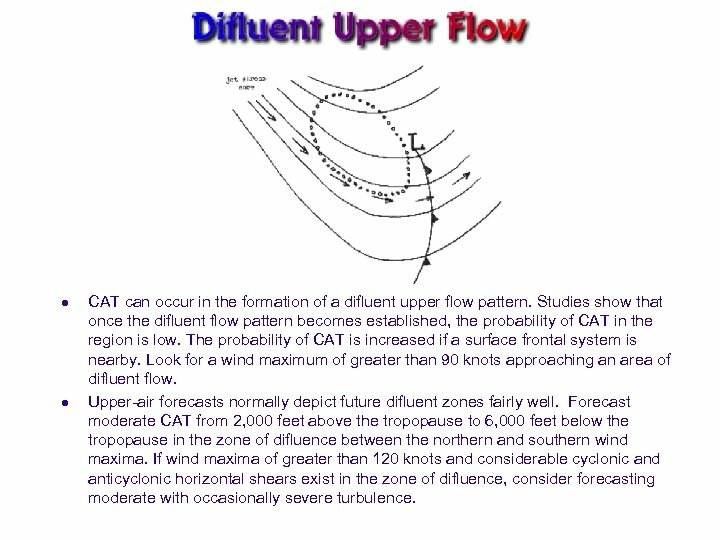 l l CAT can occur in the formation of a difluent upper flow pattern. Studies show that once the difluent flow pattern becomes established, the probability of CAT in the region is low. The probability of CAT is increased if a surface frontal system is nearby. Look for a wind maximum of greater than 90 knots approaching an area of difluent flow. Upper-air forecasts normally depict future difluent zones fairly well. Forecast moderate CAT from 2, 000 feet above the tropopause to 6, 000 feet below the tropopause in the zone of difluence between the northern and southern wind maxima. If wind maxima of greater than 120 knots and considerable cyclonic and anticyclonic horizontal shears exist in the zone of difluence, consider forecasting moderate with occasionally severe turbulence. 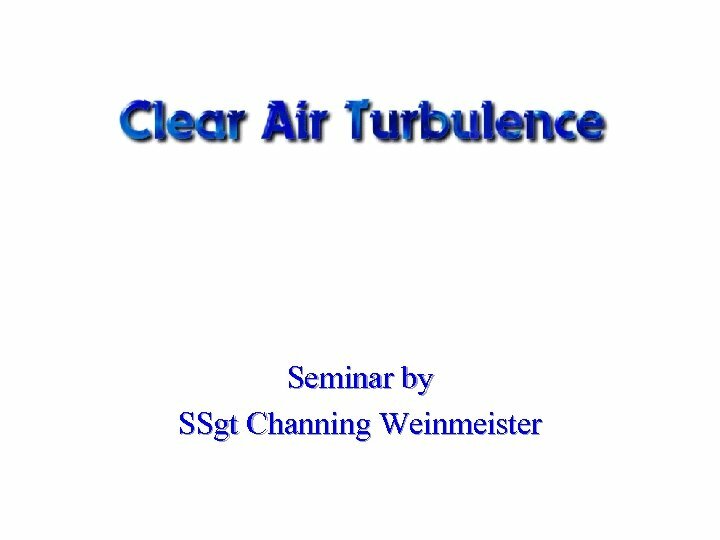 l There are several GOOD internet sources for helping with forecasting and analyzing turbulence. • • • l Water Vapor imagery is available at a number of university sites as well as the SIDAS imagery available on AFWIN. Several university sites also have upper level plots as well as graphical model outputs. 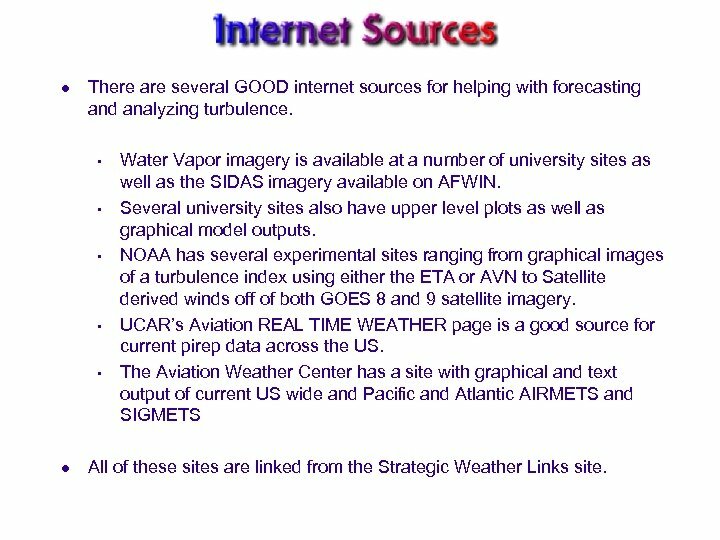 NOAA has several experimental sites ranging from graphical images of a turbulence index using either the ETA or AVN to Satellite derived winds off of both GOES 8 and 9 satellite imagery. UCAR’s Aviation REAL TIME WEATHER page is a good source for current pirep data across the US. The Aviation Weather Center has a site with graphical and text output of current US wide and Pacific and Atlantic AIRMETS and SIGMETS All of these sites are linked from the Strategic Weather Links site. 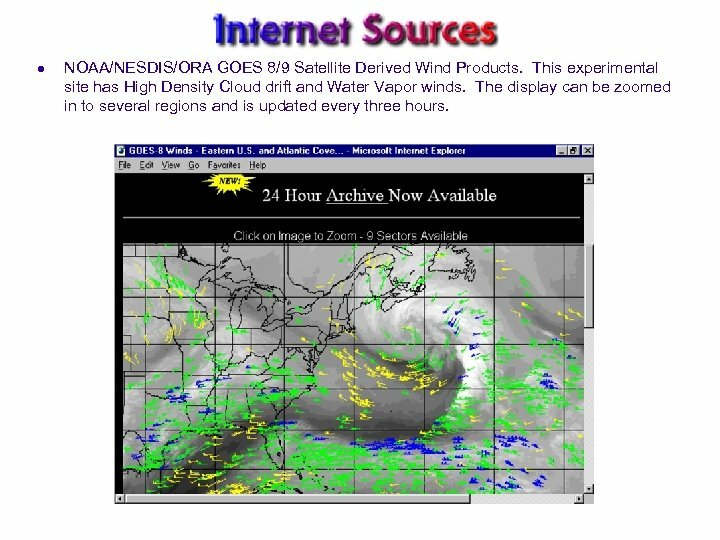 l NOAA/NESDIS/ORA GOES 8/9 Satellite Derived Wind Products. This experimental site has High Density Cloud drift and Water Vapor winds. The display can be zoomed in to several regions and is updated every three hours. 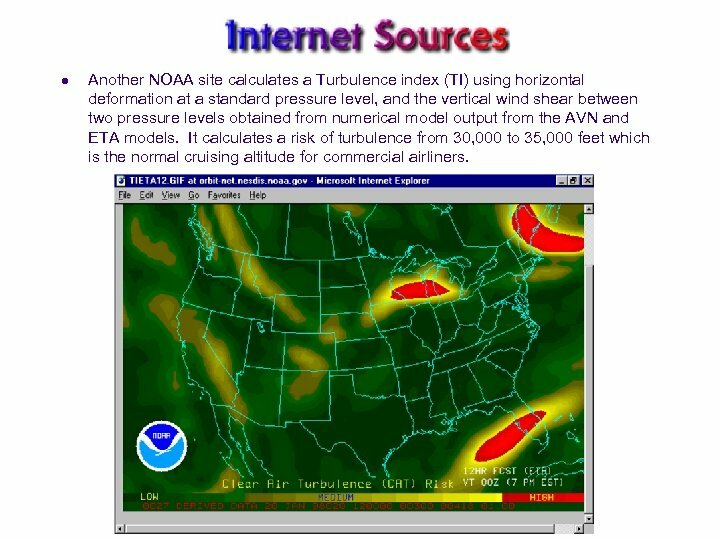 l Another NOAA site calculates a Turbulence index (TI) using horizontal deformation at a standard pressure level, and the vertical wind shear between two pressure levels obtained from numerical model output from the AVN and ETA models. It calculates a risk of turbulence from 30, 000 to 35, 000 feet which is the normal cruising altitude for commercial airliners. 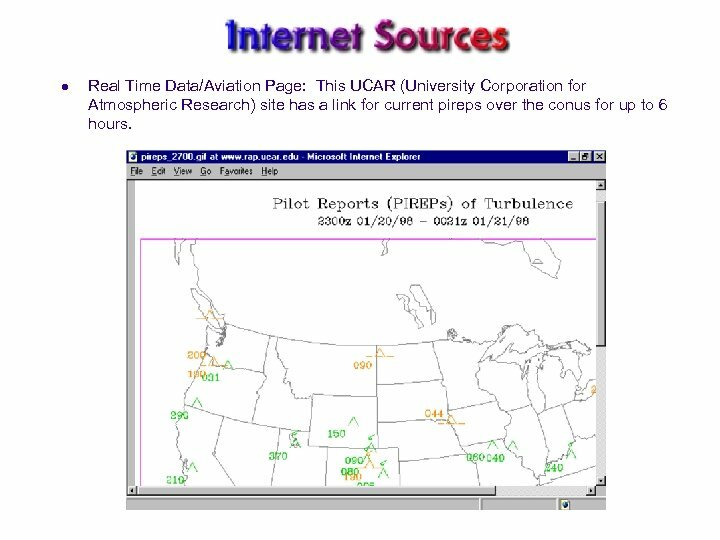 l Real Time Data/Aviation Page: This UCAR (University Corporation for Atmospheric Research) site has a link for current pireps over the conus for up to 6 hours. 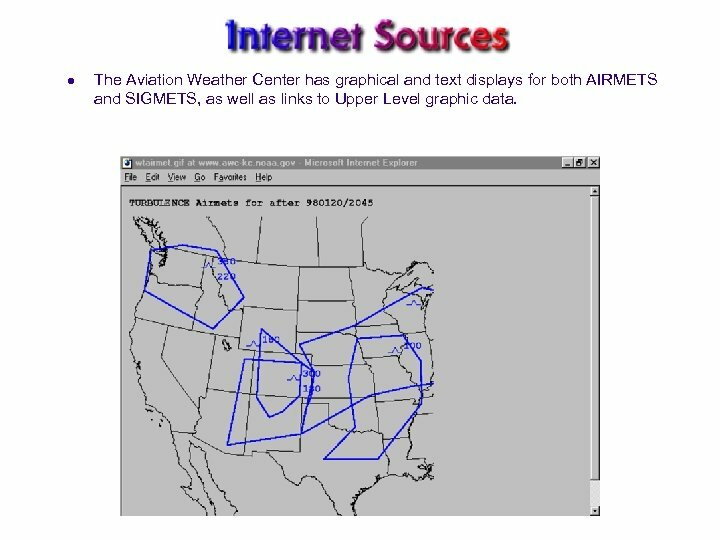 l The Aviation Weather Center has graphical and text displays for both AIRMETS and SIGMETS, as well as links to Upper Level graphic data.